1977 was an incredible year for Doug and Lynne Seus. It seems like just yesterday their arms held two 6-pound bundles. One of those bundles grew to be a giant 1,580 pound Kodiak Bear, the other was a little strawberry-blond daughter. For over four decades, bears have been the focus for the Seus family. Doug’s unique ability to understand and communicate with these giant creatures has set him apart in the world of animal training. Under Doug’s care and coaching, Bart the Bear 2, Tank the Bear, and Honey-Bump Bear have become versatile actors. 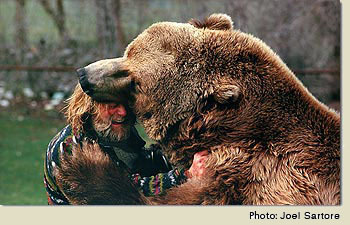 From the comedic antics of Dr. Dolittle 2, The Great Outdoors and Without A Paddle, to the spellbinding drama and adventure in such films as The Bear, Legends of the Fall, The Edge and An Unfinished Life, Bart the Bear 2, Tank the Bear and Honey-Bump Bear consistently deliver what the script calls for. Vital Ground is eternally grateful to Doug and Lynne for devoting the use of their animals to promote our mission. Donations made to the Vital Ground Foundation DO NOT in any way support Doug and Lynne's animals.